Our collection of Sacramental Certificates is not only value priced, but is beautifully designed with a style that both contemporary and traditional tastes will appreciate. Each certificate features exclusive art by Michael Adams and includes spaces for personalizing with name, date and church location. We print every piece on quality cardstock with a special finish that will even allow for use in a printer. Included with each certificate is a sealable presentation envelope, and as a bonus, we enclose a couple extra to allow for errors. 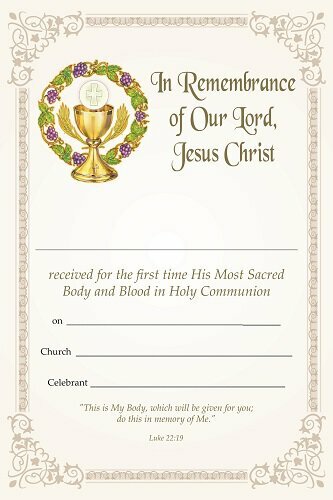 These certificates will be a wonderful addition to celebrating those special occasions in a believer's life and will make a great keepsake of their special day.